Titanic Belfast has marked the 30th anniversary of the discovery of the Titanic by releasing a list of 30 things you may not have know about the ship. The ship was discovered on 1 September 1985 nearly four kilometres (13,000 feet) underwater by Dr Robert Ballard, 73 years after it had tragically sunk. To celebrate the 30th anniversary Titanic Belfast have put together this list of little known facts about the ill-fated ship and the visitor attraction located in Northern Ireland. 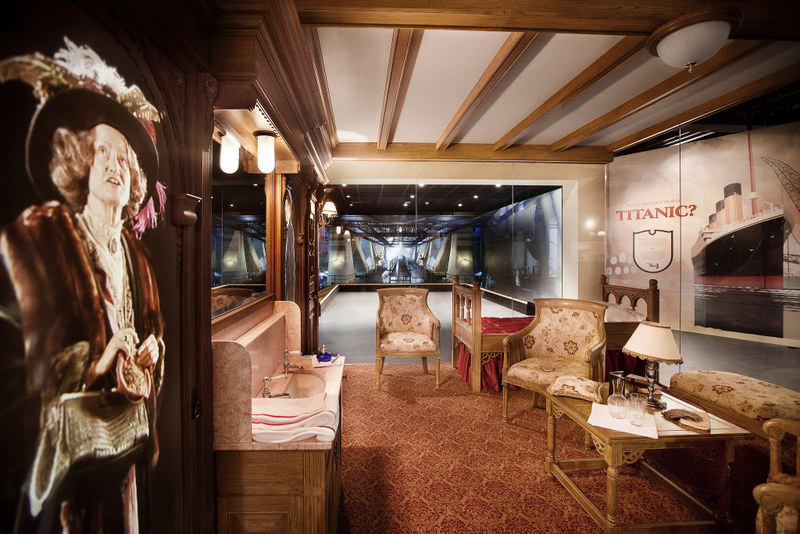 Titanic’s design was conceived over a glass of wine and fine food. Lord Pirrie and J. Bruce Ismay decided speed would be balanced with quality of accommodation. At 271 metres in length, Titanic was long enough to span three tempestuous Atlantic Ocean wave crests. Due to the size of the Olympic-class ships, in which Titanic was one of three, the shipyard, Harland and Wolff in Belfast had to prepare for two years just to be able to build them. At the time, Belfast was the fastest growing city in the British Empire and was the linen and rope-work capital, with the largest ship building firm in the world. The ship had three wheels for steering. Titanic’s funnels were wide enough to drive a train through. Facilities on board included a gym, pool, Turkish bath, a kennel for first class dogs, and a squash court. The famous staircase was inspired by the staircase at Belfast City Hall. Titanic was stocked with tons of food and drink including 40,000 eggs and 15,000 bottles of ale. Titanic was launched in 62 seconds on 31st May 1911. Titanic now lies 370 miles off the coast of Newfoundland, nearly two and a half miles (4,000 metres) below sea level overlooking a small canyon below. There is no light at this great depth and little life can be found. Titanic Belfast is built where the Titanic was designed and launched. The Titanic and SS Nomadic have been re-united again in Belfast. Titanic Belfast is the world’s largest Titanic visitor experience. It has welcomed approximately 2.5 million visitors from over 145 countries. Famous visitors include HRH Queen Elizabeth, Film director James Cameron, British Prime Minister David Cameron, Former United States Secretary of State, Hilary Clinton and Michael Buble. It can hold over 3,547 visitors at any one time, the same number as the capacity of Titanic! Titanic Belfast’s overall shape represents the bow of the ship. The hulls are the same height of Titanic from keel to Boat Deck! 40,000 tons of concrete was used in Titanic Belfast’s foundations, nearly the same as for Titanic. The world-class exhibition has recently redeveloped three galleries, which capture the excitement of launch day, as well as the ship’s maiden voyage. Guests can walk on deck, look out to sea, hear the ocean, hold onto the railings and feel the ship’s engines rumbling as if they were on Titanic itself as part of the experience. The last letter ever to be written on-board the Titanic by Essex-born Esther Hart and her seven-year-old daughter Eva just eight hours before the ship hit an iceberg and sank in April 1912 is on display. A note from the Titanic assistant ship’s surgeon Dr John Simpson, which was believed to long-lost, is also on display at the exhibition. Titanic Belfast is home to the historic plan, commissioned by the Board of Trade for the British inquiry, was designed and prepared by White Star Line architects. 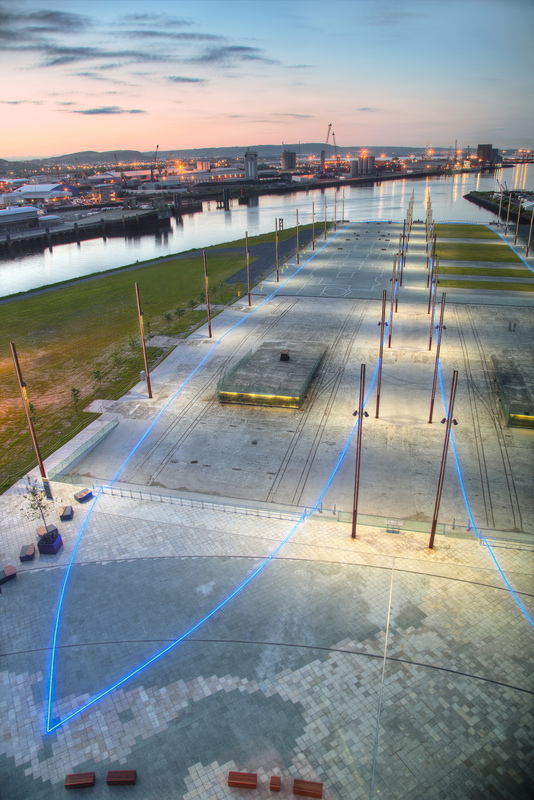 On the plaza surrounding the Titanic Belfast is one of the largest maps of the Northern Hemisphere at 10,000 square metres and follows the route of the Titanic from Belfast. The wooden benches encircling the building and are spaced in Morse code sequence. Moving clockwise around the plaza they read “DE (this is) MGY MGY MGY (Titanic’s call sign) CQD CQD SOS SOS CQD” – the distress message that Titanic sent after hitting an iceberg. On the slipways, there is life size plan of Titanic’s Promenade Deck which is inlaid in white stone, where the ship would have been constructed, outlining where the liner’s lifeboats and funnels and benches on board would have been. The Slipways have its own Memorial garden, where four grass lawns alternate with timber decking to illustrate the proportion of those who lost their lives and lived from each of the passenger classes and crew. Titanic Belfast is a six-floor building featuring nine interpretive and interactive galleries that explore the sights, sounds, smells and stories of Titanic, as well as the City and people which made her. It is the world’s largest Titanic exhibition.